The uniquely wide RaniFFS Peat fi lm is the outcome of extensive cooperation with machine manufacturers. For soil company Legro, the new fi lm is the number one choice. “The RaniFFS Peat film has been our number one choice ever since it was released. We use over two metres wide film, which is an ideal packaging material for our peat and growing media products. 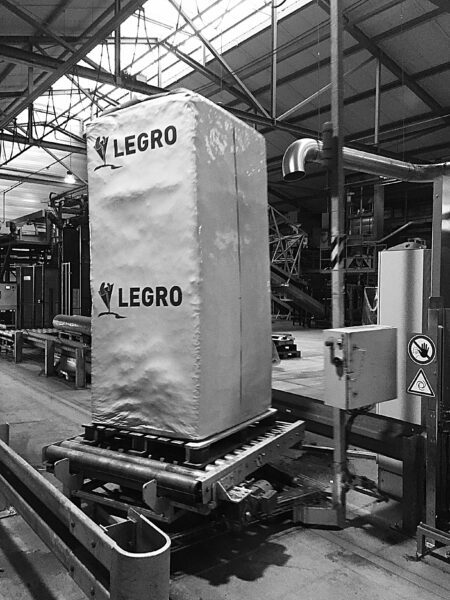 We have been very happy with the quality of Rani’s products,” says Franc Swinkels, owner of Dutch substrate and casing soil company Legro. The Big Bale press machine and the RaniFFS Peat film are sold all over the world. THE PRAISED FILM works in the same way as other RaniFFS films, the only difference is that it is designed for bigger products. “The idea of RaniFFS Peat is simple – the whole packaging is made in the same machine process. First, two films are formed to fit the product, then they are filled and finally sealed. This technique combines all customer requirements, from great design to ease of use. We are very happy that we can now offer FFS film in even bigger sizes,” Sales Manager Jan Knutar from Rani Plast explains. “Previously stretch film was used for this kind of packaging, which was also a functional solution. However, a great advantage with the FFS film is that it is suitable for high quality printing, which means that the package can also be used for product marketing,” Knutar continues. THE PRODUCT DEVELOPMENT process is the result of extensive cooperation, involving experts from both Rani Plast and machine manufacturers. In the development of the FFS film, the focus was especially on the welding properties. “The product development process of this film is a comprehensive cross-section of Rani’s know-how, as we were involved not only in product development, but also in planning the marketing and sales of the film. There is a growing market for products like RaniFFS Peat, and that’s why this is a very important showcase of our expertise,” Knutar sums up.